Obsessed with cycling, Leth is doing a TV programme where he reads his own poetry and shows a cycling race. 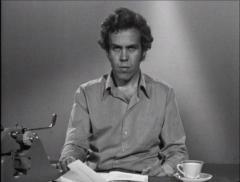 This is a “transitional film”, anticipating his cycling films while pointing back to his experimental films. The principle of juxtaposing incompatible elements is developed here: Eddy Merckx, and the 1970 Tour de France, coming from one reality that is significant, powerful and real, is offset by a poetry reading in a sterile studio. The studio becomes a controling transmission platform for words and images juxtaposed with the cycling race, representing a reality that cannot be staged.